Credited with converting hundreds of thousands of people, St. Francis Xavier is considered the most successful missionary since St. Paul. In his own life, he evolved from being a sheltered, wealthy intellectual to becoming a fearless explorer travelling to newly discovered lands, happily living among the lowest castes of people, improving their lives with love and grace. The novena in his honor, the Miraculous Novena of Grace is said to bring the force of grace into our lives, creating a more harmonious relationship with the world around us. Born in the Kingdom of Navarre, the Basque region of Spain, Francis grew up in his family’s castle. Much admired for his intellectual gifts, he was sent to the University of Paris where it was thought that he would become one of its more gifted professors. His life changed drastically when he met an older student named Ignatius Loyola who had a small band of followers. Together with Loyola, St. Francis Xavier formed a new religious order, The Society of Jesus (now known as the Jesuits) with the intention of spreading Christ’s word to the farthest corners of the earth. The King of Portugal sent Francis Xavier on his first mission to Goa in India where his country had a colony. He was concerned about the lack of religious practice available to his people and Francis’s mandate was to form a ministry for his Portuguese subjects. However, the European merchants and traders were more interested in gambling, drinking, slave trading and prostitution than in any religious preachings. When Francis Xavier attempted to meet with the Brahmin or wealthy local people, he was equally rebuffed. He then decided he would work with the lowest of the low, shocking both European and upper caste Indians by openly treating beggars, prostitutes, prisoners and the illegitimate as equals. The many eloquent letters he wrote about his life and work among society’s outcasts are still enlightening reading today. Gifted in languages, Francis Xavier had the ability to easily communicate in the various dialects spoken in the region. He is credited with saving the Paravas, an indigenous people who were pearl divers on the coastal islands from decimation and enslavement by the various Arab and European traders who plagued them. Excited by his great success, Francis Xavier travelled throughout the Far East and he was the first missionary to travel to Japan. Not always met with the same respect and openness that he offered others, he endured his frustration with good spirits. He died on the island of Chang-Chuen-Shan, never realizing his dream of reaching mainland China. His body was put in quicklime and taken back to Goa, where it lies in a much visited shrine. 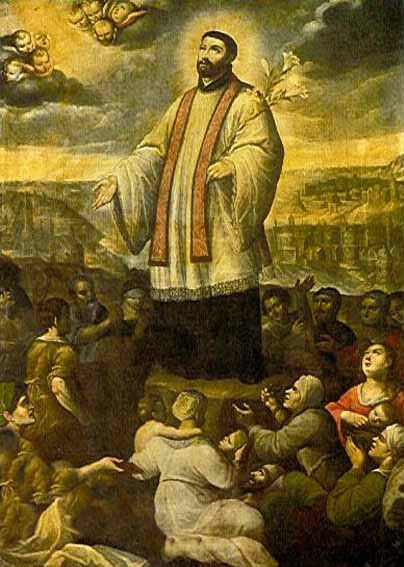 Most amiable and most loving Saint Francis Xavier, in union with you I reverently adore the Divine Majesty. I rejoice exceedingly on account of the marvelous gifts which God bestowed upon you. I thank God for the special graces he gave you during your life on earth and for the great glory that came to you after your death. I implore you to obtain for me, through your powerful intercession, the greatest of all blessings, that of living and dying in the state of grace. I also beg of you to secure for me the special favor I ask in this novena. In asking this favor, I am fully resigned to the Divine Will. I pray and desire only to obtain that which is most conducive to the greater glory of God and the greater good of my soul. (Here you may mention the grace, spiritual or temporal that you wish to obtain). (Recite one Our Father, one Hail Mary, one Glory Be). There are two times a year when the Miraculous Novena of Grace is considered especially powerful: from March 4 to March 12 and from November 25 to December 3. (Excerptef from the App, Novena:Praying With the Saints”). This entry was posted in Grace, Missionaries, Novena, Sailors, Saints, Shipwreck by sandra dipasqua. Bookmark the permalink. Babs and Harky,Your patron Saint!